Ronan O'Gara could join France on a 'freelance' basis at the end of the Super Rugby season, per Midi-Olympique. 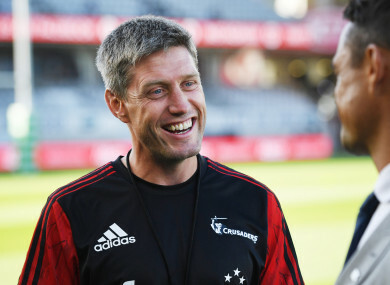 RONAN O’GARA IS close to landing a defensive coaching role with France for the Rugby World Cup, according to a report in Midi-Olympique. The former Ireland out-half’s contract with Super Rugby powerhouses the Crusaders expires at the end of this season, and the French rugby publication claims O’Gara has already spoken on several occasions with both FFR chief Bernard Laporte and France head coach Jacques Brunel about a prospective ‘freelance’ job with Les Bleus. In his most recent Irish Examiner column, O’Gara denied having been contacted by the FFR. Midi-Olympique, however, report that the Cork man is “ready to land as soon as possible with the XV of France” after the conclusion of the Crusaders’ current campaign. The French paper suggests that O’Gara would work with France during the World Cup only, “without asking for more”. O’Gara would potentially fulfill his duties alongside current France defence coach Jean-Marc Bédérède, who would remain part of the staff. Speaking on Off The Ball this morning, O’Gara’s former Munster and Ireland team-mate Alan Quinlan stated his belief that the acquisition of ‘ROG’ would provide a “big boost” for the French ahead of the big one this autumn. “I’m not sure how France will go at the World Cup — French rugby is crazy — but I think it would be a fantastic opportunity for him,” said the former back row. I can’t break any sort of protocol — he’ll kill me. Look, it’s quite open in France now that they have made contact. “I think to bring someone like him in would be a big boost. Email “O'Gara ‘ready to sign’ with Les Bleus for World Cup — French report”. Feedback on “O'Gara ‘ready to sign’ with Les Bleus for World Cup — French report”.